Whether it’s the puzzle box from Hellraiser or The Necrcomicon (Book of the Dead) from The Evil Dead, the Ark in Raiders of the Lost Ark or the ring in the Lord of the Rings, the TV in Poltergeist, the video tape from The Ring, the mask in…well…The Mask, the button in Drag me to Hell, the car in Christine, or the bracelet in The Mummy Returns, society has an attraction to narratives concerning cursed objects. Perhaps it’s our fascination with the thought that anyone could have the power to put so much negativity into and existing object. Curses are thought o be exacted for some kind of revenge. We like that thought…do something to me and I will curse. The ultimate curse, of course, is to be damned to hell. But every now and then an object comes along that’s so evil it makes YOU do all the work in damning yourself. That brings us to the mirror in Oculus. Creepy mirrors have also been a staple of horror movies from Dracula to Carrie, from American Werewolf in London to The Shining, from the awesome Candyman to Paranormal Activity and Poltergeist, even the self titled Mirror Mirror and Mirrors… ever since Alice crossed over through the looking glass we’ve been obsessed with what lies on the other side of the mirror. The big difference in this movie is the mirror wins. I should have said Spoilers! But there it is. One thing this film does really well is blend the past with the future almost like the vents of both are happening simultaneously. Once the kids go outside and see themselves in the house…the viewer knows all bets are off and these kids are doomed! But at least we get enough history of this mirror’s victims in the exposition to keep us well up in sequels for the next twenty years! 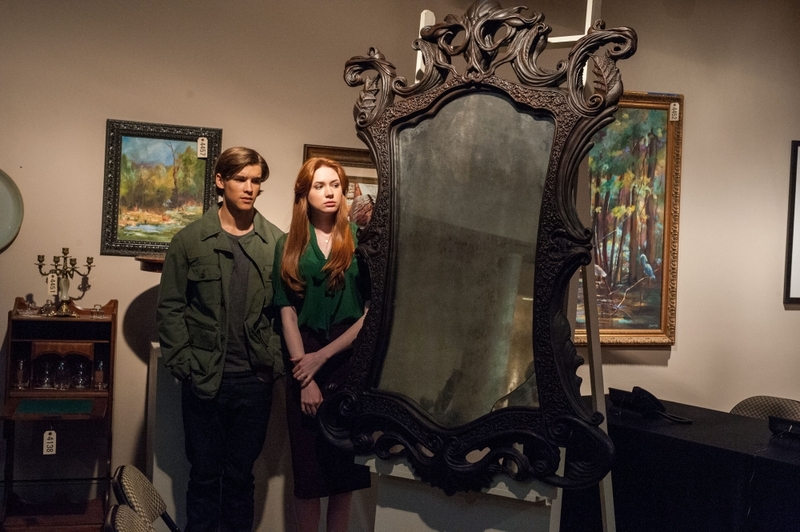 Whether this mirror is cursed or haunted doesn’t really matter…what matters is…it’s hungry!